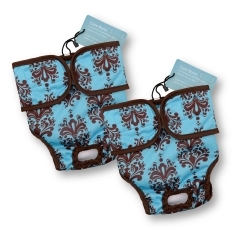 Cutebone Dog diapers help your pet keep herself clean while keeping your place clean. 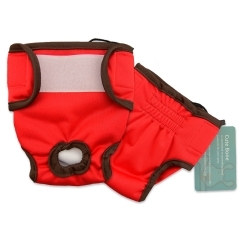 Feels very soft, smooth, and comfortable and keep your lovely dog healthy. 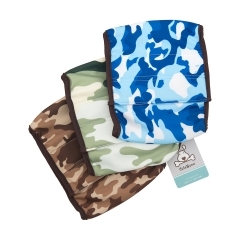 1)Cutebone pet cloth diaper, dog wrap provides super-absorbent, long-lasting protection,specifically designed for male dogs. 2)Machine washable. You can machine wash (no bleach) these diapers. Please fasten the velcro so as not to stick to other items and make the velcro more durable and sticky. Then air dry or put them in the dryer for a short time（It’s better below 30℃)then line dry. 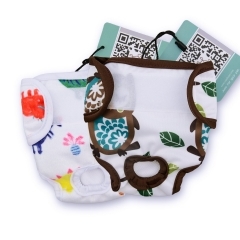 3)The diaper is Eco friendly waterproof with PUL layer fabrics which have been used for washable baby cloth diaper. 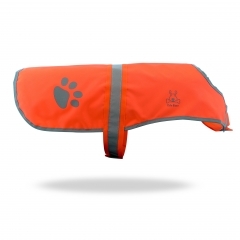 With waterproof feature, you never worry the dog get leakage and comfort of the softer, mesh fabric against skin. 4)100 days money back guarantee from the day of purchasing. All of our products are backed by 1-year warranty which gives you confidence to buy Cutebone products. 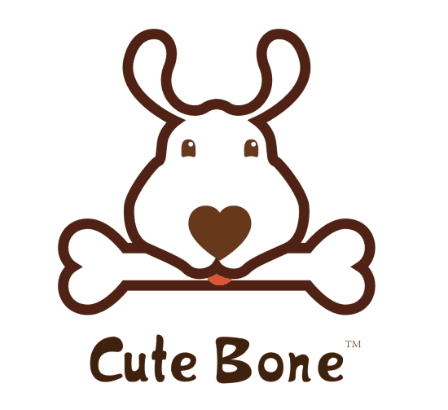 5)Cutebone is a registered trademark of designer pet clothes. Our factory designs and produces pet apparel ally by ourselves as a manufacturer. We do OEM, ODM order as well. In order to offer the highest standard products to every furbaby, a philosophy that is meticulously carried through from start to finish of our products. Material: Outer: PUL. Middle: microfiber layer. Inner: polyester mesh. 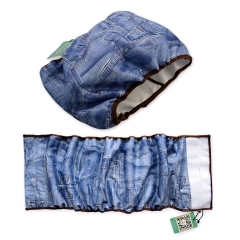 Size S: Fit dog’s waist: 8’’-18’’, wide: 6'', 3-12 lbs. Size M: Fit dog’s waist: 12’’-20’’, wide: 7'', 8-40 lbs. Size L: Fit dog’s waist: 20’’-32’’, wide: 8.5'', 40-85 lbs. We work hard to provide the best product possible by using premium materials. In order to guarantee the quality of our products, CUTE BONE IS THE ONLY COMPANY AUTHORIZED TO SELL CUTE BONE BRAND. Thanks for shopping on our store. Happy ordering. Please measure your baby carefully,because your carefully choice will avoid plenty of inconvenience of returns. Measure your pet correctly with a tape and write it down. Determine what type of the clothes you will purchase. For tops(such as dresses,shirts and coats without legs),the chest girth is the most important,please be sure the chest of a clothes can fit your pet. Slightly shorter or longer back length will be OK,but not too short or too long. For jumpsuit with legs,we should pay attention to both chest girth and back length.We don’t recommend to choose a clothes with a back length 2 inch shorter or longer than the back length of your dog. Check the size table on the product page and determine what size you need. 1.If any of the measurements are 'between' two sizes, choose the larger size.If your measurements are toward the upper end of the range given for a particular size, you may also want to choose the larger size, as you may also wish to do for heavily coated dogs to accommodate all that fur. 2.Take each measurement a bit loosely. Take each measurement a bit loosely, so there will be room for your dog to move and breathe, but not too loose. 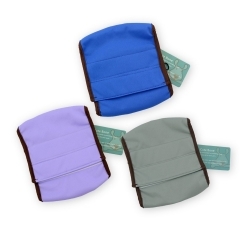 (the measurement for belly bands is the exception -- it needs to be a bit snug) . What size should be the most suitable one is up to what result you want.Some customers want a clothes to be snug,while others prefer to take a loose one.The clothes is designed in standard sizing,every pet has their own body shape,it is difficult to make sure every clothes can fit all the pets perfectly.Your understanding is appreciated. If you have any question about how to choose a size,please don’t hesitate to contact us .we are right here to serve for you.Thanks. CuteBone 3 PCS Dog Diapers Female Washable Du..
CuteBone Washalbe Female Dog Diapers (Pack o..
CuteBone Female Washable Dog Diapers (Pack of..
CuteBone Washalbe Female Premium Dog Diapers..
CuteBone Female Washable Elegant Floral Dog D..
CuteBone Washalbe Male Dog Diapers (Pack of ..